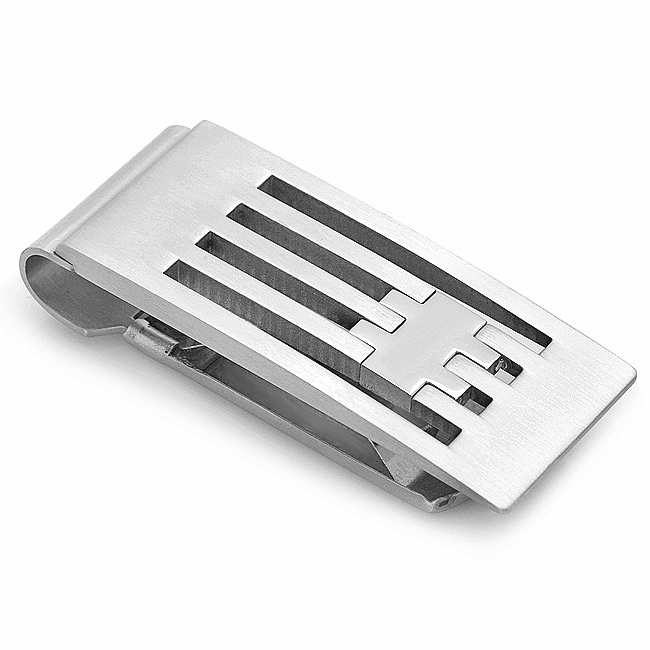 The Grill Collection money clip is a men's accessory he will use again and again. Rugged and masculine, sleek and sophisticated, this solid stainless steel clip is compact and holds up to 25 bills in a spring-loaded grip! The linked engraving plate is ideal for free custom engraving of his initials, making this a unique and thoughtful gift that he will use for years! It comes packaged in a jewelry gift box, and is shipped within 1 business day from placing your order. We're hoping to have this back in stock within a couple of months. As soon as its back in stock, we'll have it available to order. What do the different numbers mean? If you are referring to the numbers shown when you open the personalization window, this is for the font size. 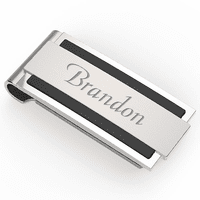 On this particular money clip, there is only one font size available as the engraving area is very small. When I try to personalize a clip with the following LLD5 then I view the sample the 5 doesn't show up in the displayed version, can it be fixed??? 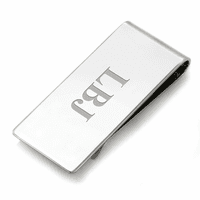 The engraving space is not very large on this money clip, we normally recommend 3 letters. We can definitely fit the fourth character though, just let us know in the comments section of our checkout page that you would like 4 characters and specify what they are. 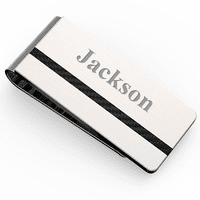 Greetings, I am looking at your Grill Collection Spring Loaded Money Clip (code: SMC-025A). I would love to engrave it but I am not sure how the options you provide for sizes actually look on the clip itself. The engraving you have on the picture of that money clip looks like an excellent size. Can you tell me what size that is? Thank you. The font sizing we used on the Grill Collection Spring Loaded Money Clip shown in the picture is a 40. It is large enough to see the initials clearly but does not take over the whole space. The item didn't arrived as promised and the monogrammed letters are very small. ProsHeavy in a good way and feels well made. Love the spring load, (hope it holds up) looks good, ordered and shipped to me quickly and it was engraved! 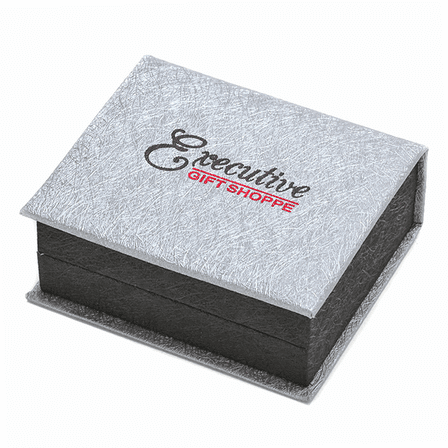 Money clip is the perfect gift, beautiful and very solid and high quality. Size was nice to fit in any pocket. Highly recommend this product!!! I've been needing a money clip for a long time. 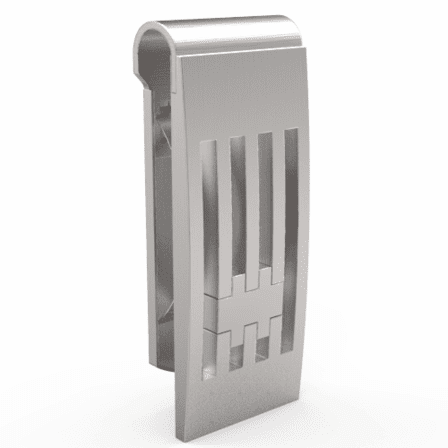 This is a great stainless steal clip. It's spring loaded, simple but very cool. I had my initials engraved on it. I can clip my Safeway card and credit card on it. I like it and would recommend this clip to everyone. I ordered this for my dad to replace one he had lost. It was delivered promptly and in a nice case. He really likes it, better than his lost one. I bought this money clip in addition to one that was equipped with a pen knife which was recently confiscated by TSA at LaGuardia. I guess the screener thought that the pen knife with an 1.5 inch blade was a lethal weapon! I bought the Grill Connection Spring Loaded Money Clip as a replacement for those occasions when I have to go through airport security. ProsWell made with a good spring loaded clip which can accommodate eight or ten bills. ConsWould have preferred it to be a little larger. Nice item, and the engraving option gives it that little extra touch of class. I bought one for my son as well, and he is equally pleased. ProsBeautiful design and execution (build quality, nice finish). ConsIt's been said by someone else already, and it's a nitpick, but item's a little smaller than I imagined. This might just be because I've never had a money clip before. It's big enough, at any rate, to do the job. I would like to put my name on a waiting list to get a few of these model items. I bought this money clip for the men in my wedding party. They all loved it. Its got a different look than other clips I've seen, it looks great in person.